Welcome back everybody to a new half term! A reminder that the school will be closed this Tuesday, 27th February for a training day for all staff on the new Primary Language Curriculum. Also, we will be closed on Monday, 5th March for a training day for all staff on new Child Protection Procedures. Some dates / events to note for this term! The RMDS Read-a-thon will launch again this year in World Book Day - 1st March 2018. The Read-a-thon is designed to encourage reading among the children, while raising funds!! 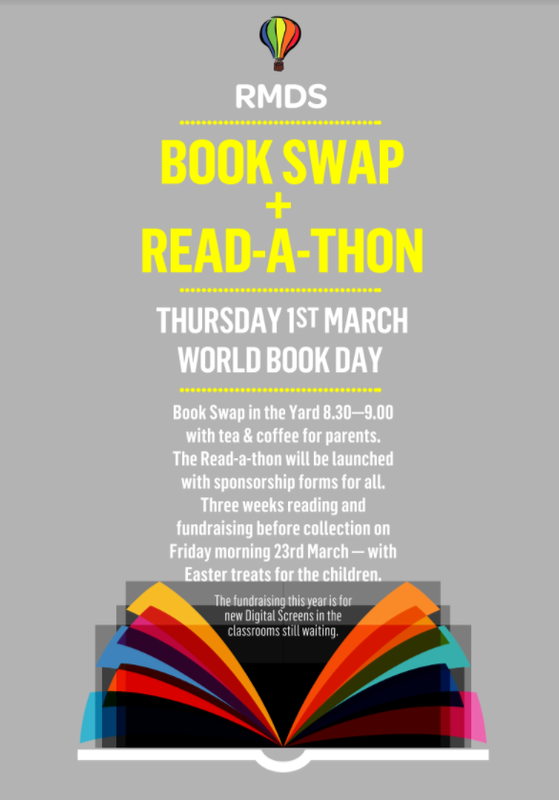 We will have the ever popular Book Swap in the school yard that morning with Tea and Coffee for parents. As we don’t want to be left with too many books, please encourage children to take similar number of books that they donated to the swap. Please do not bring any baby or toddler books. We will have some adult novels for parents to browse through while enjoying coffee - but please do not leave any adult books for the swap as we have plenty to choose from! The Read-a-thon will run from March 1st to 23rd. Read-a-Thon pledge forms and details will be distributed in class on the 1st March, and all funds raised will be collected on the 23rd March. Kids will be rewarded with Easter Treats that morning! All funds raised will go towards digital interactive white boards for remaining classrooms. Please also keep an eye out for the class rep email which is gauging the parent body interest in Irish Language classes. We hope to have an update in time for the Maidin Caife so please do fill in the online form. Go raibh maith agaibh! Another School Gate highlight! Tickets will go on sale the week of 20th March! Raffle draw to take place on Friday 23rd March. If you’re not in.....!!!! This is confirmed for Sunday 10th June - time to start the rigorous training regime! The Woolly Hat Walk was a wonderful success! Thank you to everyone for their great efforts to walk to school on this day! We had a great increase in the number of people walking to school, with 77 people walking to school on Friday, 2nd of February and an amazing 140 people walking to school on our woolly hat walking day on Friday, 9th of February. That's an increase of 63 people walking to school! 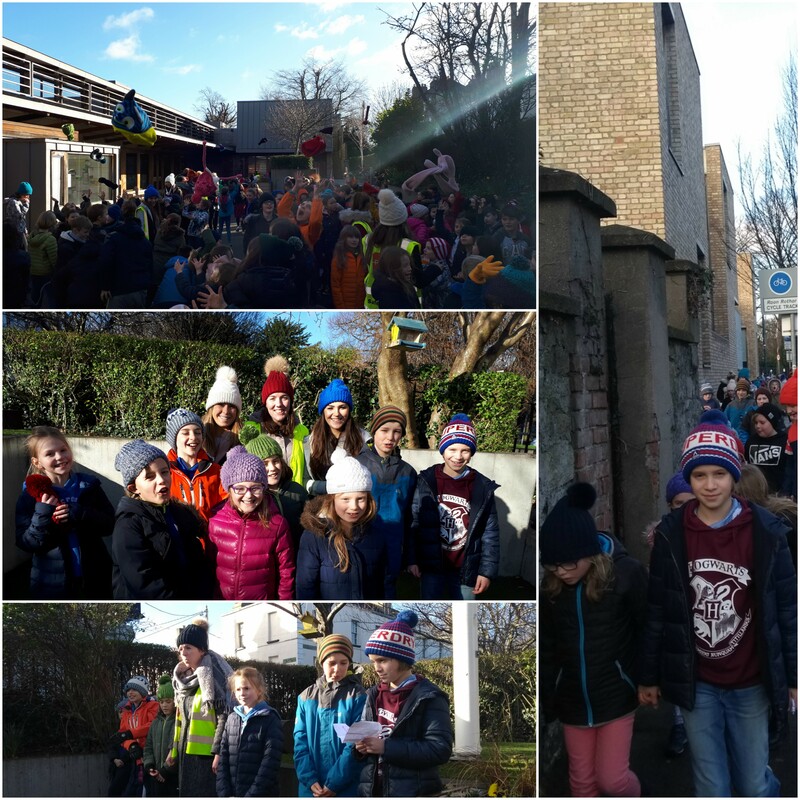 As part of our woolly hat walk day the whole school also took part in a walk around Ranelagh. We all had a great green day! Dance: Isabelle is going to contact parents directly to arrange a session in Wesley House for the RMDS gang with her wider group.